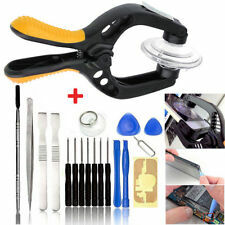 Smartphone Tablet LCD Screen Opening Plier Phone Repair Screwdriver Pry Tool Set. 1 Pentalobe (Torx/ Star) Screwdriver. 52mm big sucker, strong suction, force uniform, take apart screen are much easier, particularly suitable large-screen phone. Professional Premium Screwdriver kits for repair iPhone 7, iPhone 7plus, iPhone 6Plus, iPhone 6S /6/5S/5/5C/4S/4/SE, iPod, iTouch. 100% New Precision Screwdriver Repair Tool Kit Set with premium quality. Sim card can be used for the Phone Sim card and Micro Sim card.2. Compatible Model:universal for Apple iphone x 8 7s 6s 7plus 6plus SE, samsung galaxy s7 s6 s5,Huawei ,Xiaomi,HTC,LG,Motorola,etc. Note: Due to the light and screen difference, the item's color may be slightly different from the pictures. Huawei Honor Magic the screen glass and the LCD are fused together, so professional technician might be needed for replace the cracked glass. Huawei Honor Magic. The item is intended for when your phone screen lens cracked, but LCD display works. Smartphone Tablet LCD Screen Opening Plier Phone Repair Screwdriver Pry Tool Set. 1 Pentalobe (Torx/ Star) Screwdriver. Also works great for furniture repair soft and hard woods, upholstery, leather work etc.